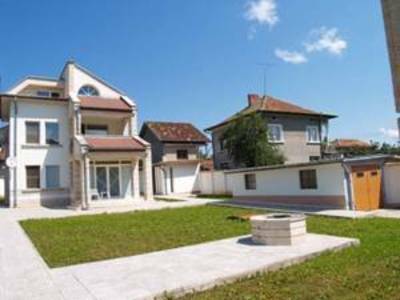 A house is for sale, situated in village 15 km away from Vratsa town. The town is district center and it has rarely beautiful vicinity. The district is attractive place for the tourists with its nature and historical sights. The basic records in the town are: ethnographic complex "Sofronii Vrachanski"; complex Messenger and tower of the Meshchiite. In the region can be observed several caves and enjoy the beauty of two waterfalls Skaklia and Pine stone. In Vratsa town every year can be seen International theatric festival of young people "Time" and national festival of little theatric forms. 1 floor- one big premise, which consists of kitchen, dining room and living room; premise for heating and bathroom with toilet. The floors are tilled with terracotta and the walls are painted with latex. There is one big veranda which is tilled with stone. There is inside stairs tilled with stone and parapet made by wrought iron. The house has three phase and mono phase electricity, phone, cable TV, internet. There are three heating variants: local heating, fireplace and under floor heating. The exposure is south and the frames are PVC. An asphalt road leads to this property. The yard is 1000 sq m. There are two wells, garage, barbeque with a sitting place and one shed. The yard is full of greenery and the alley is tilled with stones. The fence is massive, tilled with stone and it is 2,5 m height.